As I stepped out of Union Station on January 21, a wave of high-pitched screams hit me. It was loud. The feminist Women's March on Washington, D.C. was about to begin and throngs of people hurried to assemble at 3rd Street and Independence Ave. At random intervals throughout the day the tribal-sounding whoops rose and fell, without any apparent reason, spreading like electricity through the sprawling crowds. But what I saw was much more troubling: Vulgar signs filled the streets of our nation's capital. Vulgar behavior. Vulgar speech. Vulgar clothing. Vulgarity was so widespread that the Women's March could more aptly be called a parade of vulgarity. At least one sign on display attacked the Blessed Virgin Mary; others mocked the holy rosary. This gathering was more than a bunch of disgruntled voters unhappy with Donald Trump's election to the presidency. 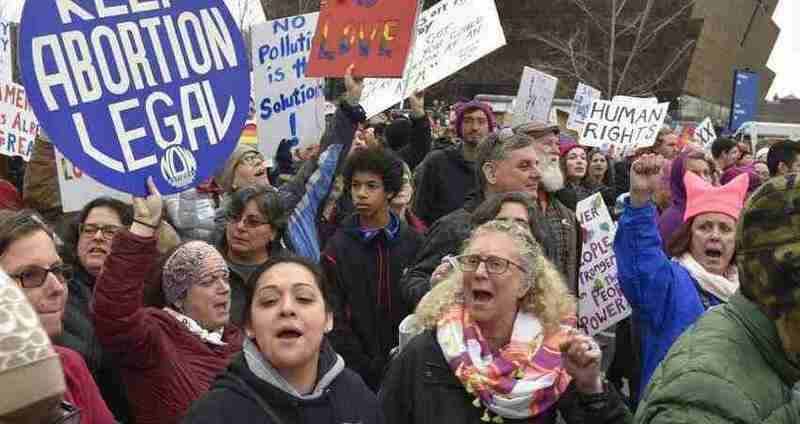 Ultimately, this march reveals how America is divided in two, split between those who are for God and those who are against Him. The march drew an estimated 500,000 people to downtown Washington and was sponsored by prominent pro-abortion groups such as Planned Parenthood, NARAL Pro-Choice America, the ACLU, and Human Rights Campaign. Partner organizations included Georgetown University College Democrats, a long list of pro-homosexual groups as well as the Communist Party USA. Rainbow flags waved in all directions. And as far as the eye could see, signs depicting female private parts polluted the horizon. This surrender to indecency was apparently meant to elicit more "respect" for women and promote a sense of "equality." The feminist movement itself was promoting the objectification of women. And the men in attendance -- about 10% of the marchers -- participated and applauded the shameful exhibit of immodesty. In this atmosphere of sin, I saw many parents who made their young children hold signs with crude images or phrases, coaching them to yell pro-abortion chants: "My body, my choice!" "Her body, her choice!" Although the area was packed with nearly a half-a-million women, I didn't find a single lady. I couldn't find a woman who carried herself with grace and dignity proper to the her nature. Not one. Without any apparent friction, every imaginable leftist cause melded into one tribe. Feminist and pro-Islamic advocacy groups joined forces with environmental and immigration activist organizations; radical pro-abortion and pro-homosexual groups marched comfortably together with cross-dressers, gun-control advocates, dissident Catholics, socialists, communists and atheists. Speakers and participants united against moral values, against the traditional institution of the family, against natural marriage. What united them was contraception, abortion, euthanasia and ever-expanding demands of the LGBT movement. As I made my way to 14th Street and Constitution Avenue I passed a group of street preachers. They were surrounded by a number of pro-homosexual men who started yelling, "Hell isn't real. Hell isn't real." The crowds in the area took up the chant, repeating, "Hell isn't real." I paused to take some photos of the passing parade. After spending a few minutes on the sidewalk of Constitution Avenue the crowd flung into cries of rage. Why did they turn so wild? Glancing to my right I saw a large banner held up high for all marchers to read: "Abortion Betrays Women." A brave contingent of Students for Life of America assembled around the banner. They had their own bullhorns and used them effectively to shout pro-life slogans. The simple sight of the pro-life banner enraged many pro-abortion marchers. No. They couldn't ignore it. So they responded by yelling frantically over and over again at the top of their lungs: "My body, my choice!" By yelling so much, I got the impression they wanted to muffle or try to erase the voice of their conscience. For sure, many of them had had abortions. And no matter how many tricks are tried to silence the truth by pretending that killing an innocent unborn baby is a "choice," natural law, which is ingrained in human nature, must percolate back into these women's minds with a different message: abortion is wrong. Some of the signs held by members of Students for Life were ripped up by abortion advocates. A woman pulling a child in a wagon caught my attention. She passed right in front of me. I looked down at the toddler. "This lucky child... survived abortion," I said. Instantly the child's angry mother snapped back: "Thanks to abortion I have her. I aborted my first one." Before I could recover and respond with something meaningful, she vanished into the moving mass of marchers. Did the poor child, only 5 or 6, even know what abortion was? One of the signs I saw was more direct. It evoked the French Revolution with the outline of a guillotine. 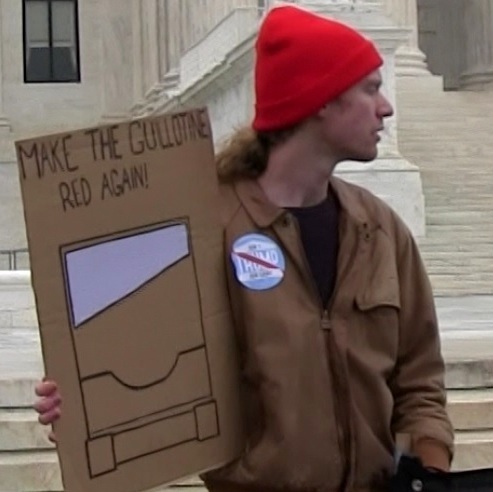 Above a silver-colored blade ran a line of text: "Make the guillotine red again." The anarchist holding the sign refused to be interviewed, but I chatted with him and he didn't hide what he wanted: the elimination of the leading class of society. "Make the guillotine red again." Granted, not everyone at the march was an anarchist with the explicit desire to eliminate the leaders of society, at least not with the guillotine. Instead of using the guillotine, however, most of the marchers vehemently supported the killing of innocent pre-born babies, including their own offspring, if that's what their "choice" happened to be. Most of the marchers supported Planned Parenthood which harvests baby organs for profit. Just as the cry for "equality" dominated the bloody scenes of the French Revolution and the massacres perpetrated by the Communist Revolution, the same cry of "equality" reverberated on the lips of the sexual revolutionaries on the modern streets of Washington. In the name of "equal rights" babies are aborted, marriage is redefined and, now, biology is discarded to make room for transgender "equality." Isn't radical egalitarianism the common thread that links all revolutions together? Doesn't the constant cry of more "equality" contain Lucifer's spirit of revolt against God when he said non serviam -- I will not serve? You decide.